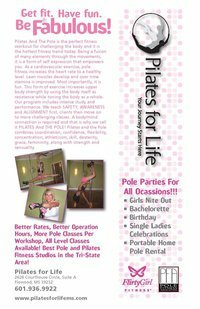 The Pilates for Life Studio now offers pole fitness classes and parties for women of all ages, sizes, and fitness levels. Our multi-level classes include a warm-up/stretch, strengthen, pole routine, and floor work with options to challenge both beginner and advanced level students. We offer pole, pole fit, pole tricks, special classes and workshops, as well as private lessons and instructor training. Build strength, flexibility, and confidence with this incredible mind and body workout. Get fit, have fun....feel fabulous! Parties are perfect for any ladies night out event!!! - Deposit is due at the time of booking, the remaining balance will be due at the beginning of party. If you guarantee 15 paying people or more, we will add another instructor free of charge. 6 People min. / 20 people max. We require 14 days advance notice to cancel or reschedule all parties. - Bachelorette will recieve a Goodie Bag!